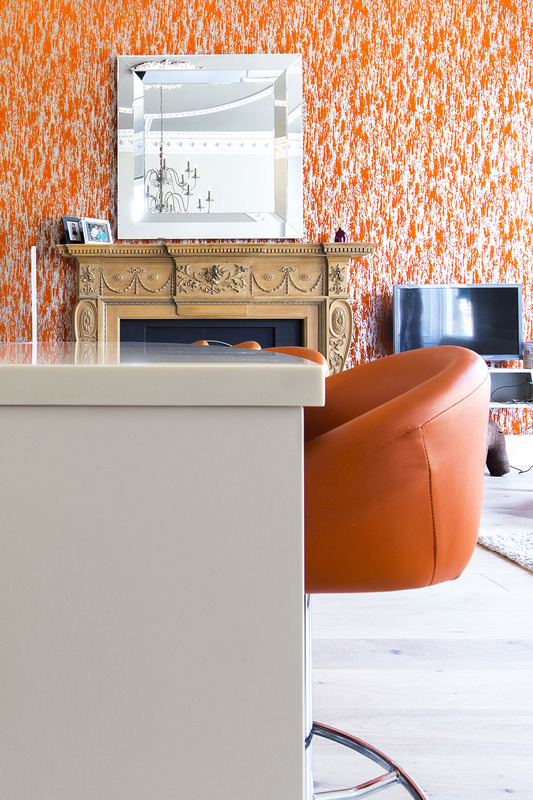 The Barclays were looking for a minimalist design that complimented the height and scale of the period room, but which would not overshadow it or distract heavily from the original features. 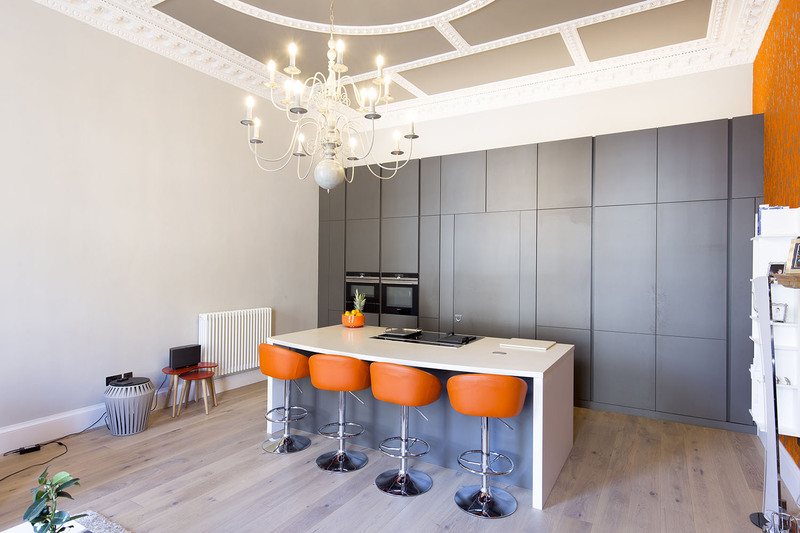 Being listed, the property also came under specific constraints imposed by City of Edinburgh Council in relation to the kitchen design. 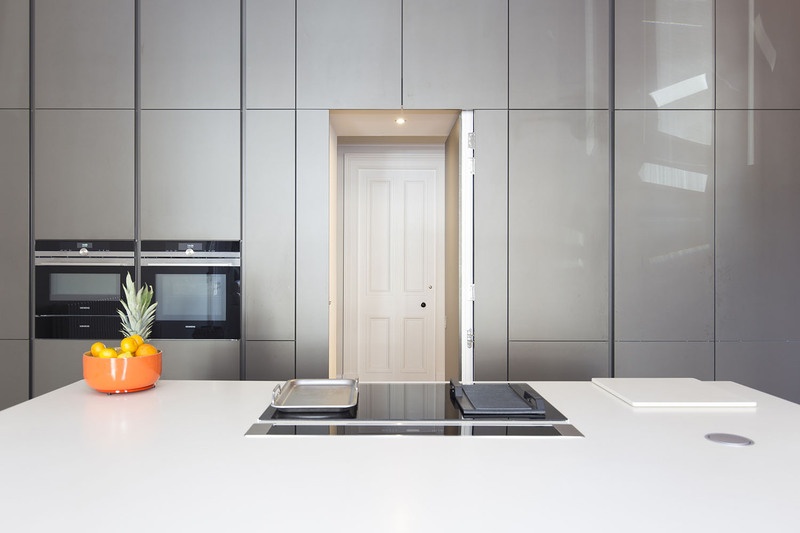 The biggest constraint was that the kitchen must be fitted on the north wall of the room – a particularly challenging proposition given that also on this wall was the door through to the private quarters of the property from the kitchen and living spaces. 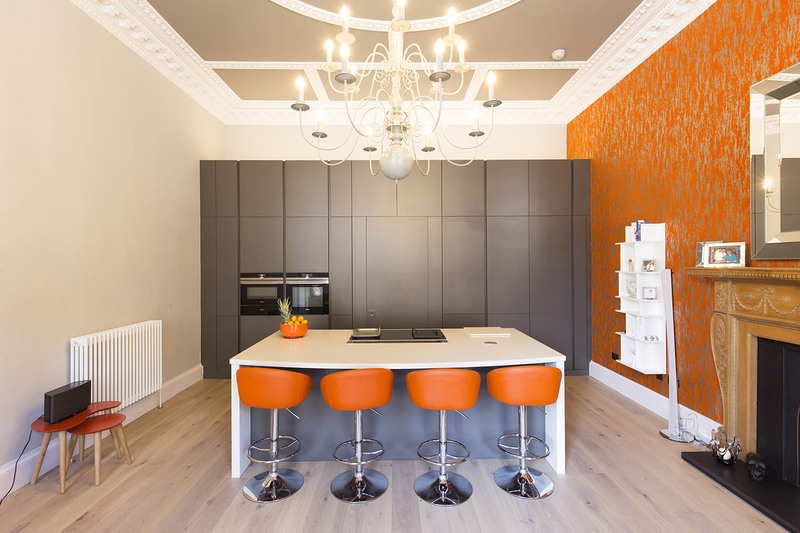 The new owners had recently purchased this Grade B listed apartment in Edinburgh when they approached KI to provide the kitchen design for what was a major all-inclusive renovation of the property. 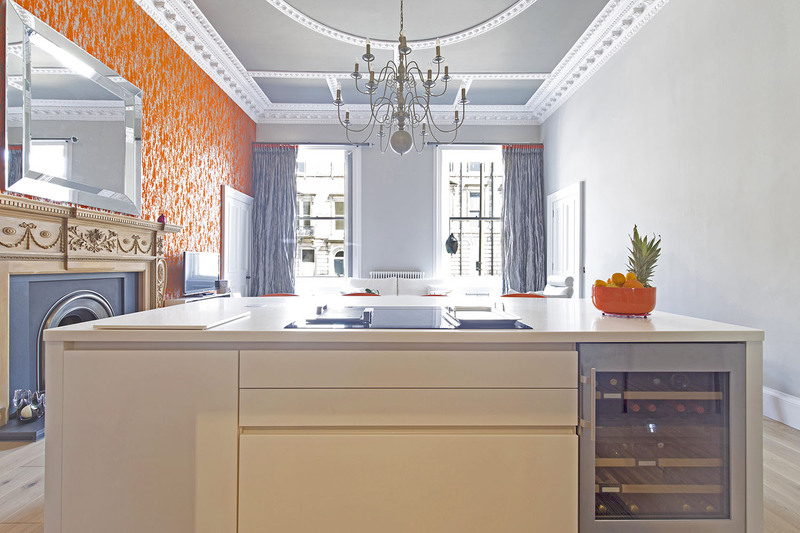 In order to comply with the restraints of the listed building, the kitchen had to be fitted to the north wall of the room which contained an internal fire door. In order to provide the Barclays with the minimalist design that they were after, the solution was to conceal the fire door in a wall to wall run of Leicht Ceres Lava furniture tall housing units. Also included in this bank of cabinetry is a tall pocket door housing, containing the sink, dishwasher and boiling water tap, as well as the oven, combi micro, warming drawer, full height fridge/freezer, 2 pull out larders and full depth stacked wall units. The island is a much simpler affair, using Leicht Ceres magnolia and Contino handleless furniture finished with a 58mm Vanilla Corian worktop. 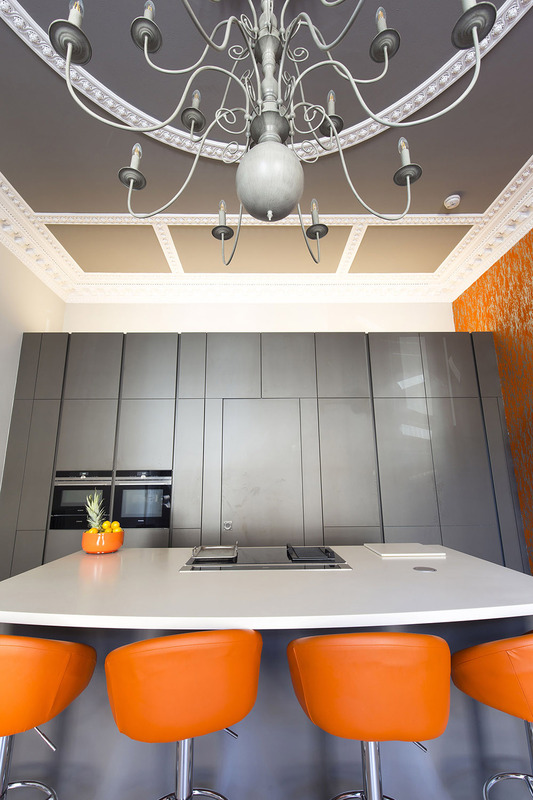 This beautiful island includes a Siemens induction hob and downdraft extractor, full depth pan drawers, integrated eurocargo waste separation system and a Liebherr dual zone wine cooler. Due to the constraints of the listed building and complying with building regulation code for the internal fire door, this was one of our more challenging installations. However, with excellent pre-planning and project management – the installation was completed without fault.